Rim a martini glass with sugar. In a cocktail shaker filled with ice, combine the liqueur, cream, schnapps, and vodka and shake. 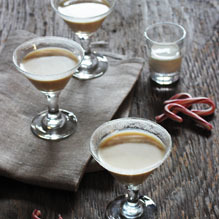 Pour into the prepared glass and garnish with the candy cane before serving. Toast the holidays with a festive cocktail.